Many of the protesters were from Cambodia, where Prime Minister Hun Sen has dominated politics for 30 years. As U.S. President Barack Obama greeted leaders of the 10 members of the Association of Southeast Asian Nations at the Sunnylands estate in Rancho Mirage, California Monday, protesters outside said they want human rights at the top of the agenda. Among the hundreds of protesters outside, many were from Cambodia, where Prime Minister Hun Sen has dominated politics for 30 years. “We are here today to send a clear message to Hun Sen that we don't support communists, we don't support a dictator, we don't support a tyrant,” said Bona Chhith of the Cambodian American Alliance. “Hun Sen must go,” he said. A police officer looks on as protesters line one side of a roadway leading to Sunnylands where U.S. President Obama prepares to host leaders from Southeast Asia at the ASEAN Summit in Rancho Mirage, California, Feb. 15, 2016. 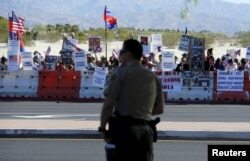 Protesters line one side of a roadway leading to Sunnylands where U.S. President Obama prepares to host leaders from Southeast Asia at the ASEAN Summit in Rancho Mirage, California, Feb. 15, 2016. The standards, the protesters say, are not high enough. “TPP allows for corporations to offshore jobs to countries with the weakest environmental protections where it's easiest to exploit workers and create a downward momentum in wages here in the United States,” said Lua Masumi of the Citizens Trade Campaign, a coalition of labor and rights groups. 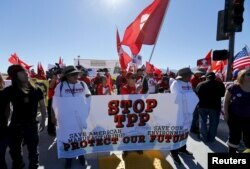 Obama said the talks will create opportunities for workers in the United States and Southeast Asia. The demonstrators say they're not convinced. 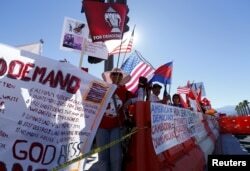 Protesters line one side of a roadway leading to Sunnylands where U.S. President Barack Obama prepares to host leaders from Southeast Asia at the ASEAN Summit in Rancho Mirage, California, Feb. 15, 2016.